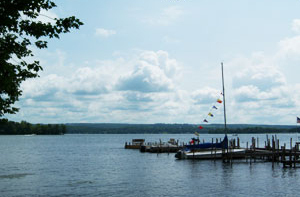 Tucked away in a lovely wooded setting on Chautauqua Lake is one of the finest accommodations on the lake -- Pine Hill! We are located mid-point on the west side of the lake, two miles north of the Chautauqua Lake bridge, and we offer a relaxing, refreshing spot for a vacation. We provide the best variety of accommodations in the area. We offer recently remodeled suites, efficiencies, motel units and 1,2,3, and 4 bedroom cottages. In our 44nd year of ownership, we have a long-standing reputation of being one of the best and cleanest accommodations in the Chautauqua Lake area! All of our units have cable televisions, decks or patios, picnic tables, and access to a private waterfront. All units, except #6, are air-conditioned and Wi-Fi is available. Settle into the accommodation style that suits your needs. Then wander down to the private waterfront for lounging in a chaise, fishing off the dock, docking your boat, sunning on the dock, or resting in the shade of the maple tree. And don't miss the children's playground. Let the children crawl in the boats and be a ship's captain, ride the train engine, play in the sand, climb the tower, swing and slide. You will like our pleasant surroundings, friendly people, and modern well-kept comfortable units. We invite you to visit Pine Hill and check us out.